Soccer is the world's game, more popular than any other sport. Fans fill stadia, and players strive to perform at the highest levels for them. Soccer's Most Wanted™ II presents more of the best and brightest, funniest and freakiest, and the highs and lows of soccer. Unfortunately, due to sales rights restrictions, we cannot offer Soccer's Most Wanted™ II for sale in your country. Soccer is the world's game, more popular than any other sport. Fans fill stadia, and players strive to perform at the highest levels for them. 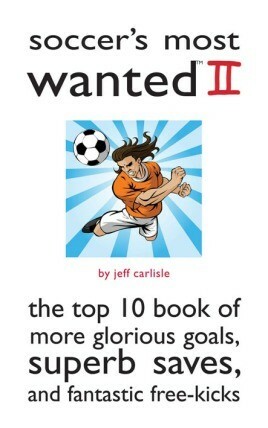 Soccer's Most Wanted™ II presents more of the best and brightest, funniest and freakiest, and the highs and lows of soccer. It highlights the crazy incidents and interesting bits of trivia that have helped make soccer (football to the rest of the globe) the most-watched sport on the planet. Everyone remembers the World Cup winners, but what about the best teams who fell just short? And what about the great players who never got to appear on the world stage? Then there is the burgeoning American game, thanks to the steady progress of Major League Soccer and the strides made by the country's respective national teams. Jeff Carlisle presents all that and more in fifty top-ten lists chock full of entertaining stories. He covers strange injuries, bizarre bookings, and some of the more colorful feuds worldwide. He discusses the greatest players to travel from the MLS to overseas and lambastes the biggest flops who came to MLS assuming glory and fell flat on their faces. He covers European leagues and players too, from the EPL to Serie A and everything in between. Through it all he presents the game as only a true follower can, with an expertise gained through years of coverage. Soccer's Most Wanted™II brings the beautiful game to life!